or even NASCAR with these popular cards. They are constant reminders of the recipient's favorite team and your customer's brand. 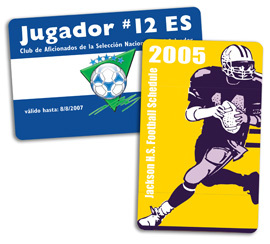 Sports Schedule Cards can be printed in a variety of shapes or sizes, in addition to the standard credit card size. Please contact Plastic Works to discuss the many options offered.